Located in the Heart of Key West Historic Seaport District you will find this 19th Century Treasure. The â€œSeaport Innâ€ is just minutes away from all of Key West finest â€“ Historic Seaport & Boardwalk, Museums, Art Galleries, Theatre, World Famous Duval Street, Restaurants & Bars, Beaches, Charter Boats. 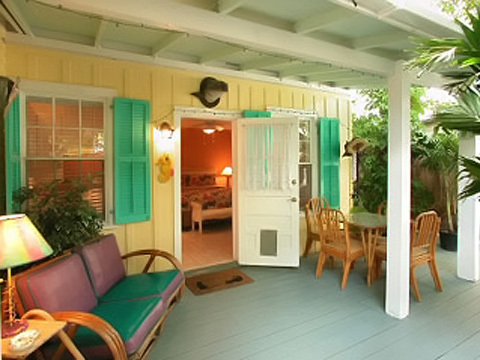 The â€œSeaport Innâ€ is one of the most unique Key West Guesthouses â€“ having only six units makes these Key West Accommodations so great! You will find The Seaport Inn private, cozy, comfortable and to have one of the best locations found on the Island. Come and relax in our tropical garden or take a plunge in the pool or just smell the ocean breeze from your balcony and the Jasmine in the air. The Seaport Inn is a perfect place for anyoneâ€™s Key West vacation or hideaway or Special Event â€“ including Birthdays, Anniversaries, Weddings, Family Reunions just to name a few. Come Stay with Us. Chuck, Linda & Courtney Krumel recently purchased this wonderful 19th Century Victorian Inn. The Inn established in the late 70â€™s and in the past several years known as â€œNancyâ€™s William Street Guesthouseâ€ has been renamed to Courtneyâ€™s Place Too our â€œSeaport Innâ€. With the Historic Seaport District just a block away and history telling us that this Victorian jewel was once called home to some of Key Westâ€™s Finest Old Sea Captains â€“ we found the name â€œSeaport Innâ€ to be so fitting. You will find our doors open to all and especially to all return guests. Our plans are to maintain the same ambience & amenities the previous owners once offered â€“ plus more. You will find that we are not newcomers to the guesthouse business or Key West. We moved to the Island well over 30 years ago. Back in the mid 80â€™s we created â€œCourtneyâ€™s Placeâ€ - Historic Cottages & Inns, which consists of a little something for all - cottages, private rooms & efficiencies. Today Courtneyâ€™s Place is one of the most successful inns on the Island, we are so pleased to include the Seaport Inn to our family. Please check us out @ www.courtneysplacekeywest.com We find the â€œSeaport Innâ€ is unique in itself. Having only 6 units is one of the great things that make this inn so special and a welcome addition to Courtneyâ€™s Place. 4 of the units are 1 bedrooom suites Plus living rooms & kitchens - the other 2 â€“ one a private room & bath and lastly a wonderful garden & poolside efficiency. All accommodations do have private entrances as well as baths. Atmosphere is definitely laid back around here. You will find the pool and garden a tropical oasis. The Seaport Inn is also a perfect size if you are planning that special family reunion, wedding or just special get together with â€œFriendsâ€ - Rent an Inn â€“ come sleep with us... Location is everything and the Seaport Inn has one of the best locations on the Island in a wonderful neighborhood within walking distances to all main attractions. Being only 4 blocks from our main inn and 3 blocks from world famous Duval Street , 4 blocks from the Sunset Celebration and within eyesight of the Historic Seaport and Boardwalk. You will find yourself only steps away from some of Key Westâ€™s Finest including Museums, Art Galleries, Restaurants, Beaches, Shopping & Charter Boats To name a few â€“ Boâ€™s Fish Wagon, The Schooner Wharf Bar, Pepeâ€™s, Half Shell Raw Bar, Harpoon Harryâ€™s, Waterfront Market, Flaglerâ€™s Railroad Museum, and Key West Ferry Terminal are all just around the corner. So if you are looking to â€œStay in Key West Like a Nativeâ€ â€“ youâ€™ve found the right place - Seaport Inn or Courtneyâ€™s Place.